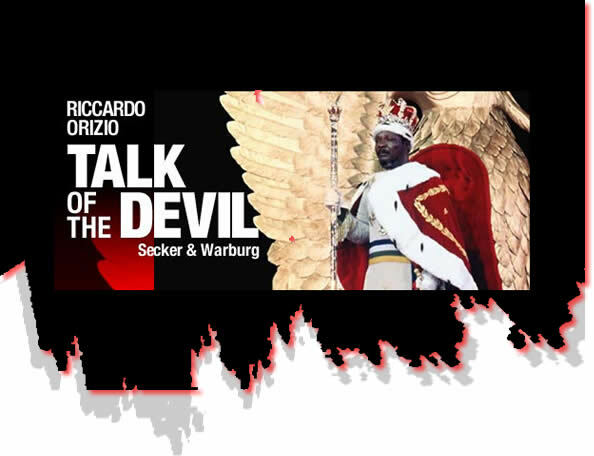 For many years, explains the Italian journalist Riccardo Orizio in the preface to Talk of the Devil, he carried in his wallet two newspaper clippings about the deposed African dictators Idi Amin and Jean-Bedel Bokassa as he traveled around the world. Eventually they germinated into a full-scale project in pursuit of "fallen tyrants" and their reflections on the arc common to all their lives -- extraordinary lives in which they had had everything and lost everything, with "no time to start again." Orizio specifically pursued figures whose careers ended in utter disgrace, in the indignity of exile or imprisonment, because those despots still in power, or those merely ousted from it, "tend not to examine their own conscience." And so he tracked down figures like Amin and Bokassa, as well as Nexhmije Hoxa, widow and co-tyrant of Albanian dictator Enver Hoxha, Polish premier Gen. Wojciech Jaruzelski, Haitian president Jean-Claude Duvalier, Ethiopian leader Mengistu Haile-Mariam and Serbian leader Slobodan Milosevic and his wife, Mira. Orizio seems to have hoped to come up with a series of cautionary narratives told by the tyrants themselves, and thereby to humanize these remote and forbidding figures. He quotes with approval actor Ian McKellen, who has brought to life "monsters of every epoch from Iago to Rasputin": "One of the few lessons I have learned from studying people who do terrible things is that they are all too human. And that we are all too capable of doing almost anything." If there is anything universally human about Orizio's subjects, however, it is not their megalomania, paranoia and utter lack of regard for the value of a human life (an estimated 3 million were murdered by Idi Amin's regime), but rather the more banal tendency toward denial, protestations of innocence and an espousal of noble ends without consideration of the means used to achieve them. Incapable during their years in power of tolerating anything remotely like a point of view different from their own, they now insist there is an alternate side to the story commonly told about them; they speak dreamily of ambitions still unfulfilled and bitterly of betrayals and set-ups. Consider the words of Nexhmije Hoxha. "Had she any regrets about ordering the torture and persecution of her opponents?" Orizio asked her. "[Her] jaw tightened. 'No.' And she repeated it. 'No. Because a state has to defend itself from those who plot against it. Of course, there may have been some excesses.' 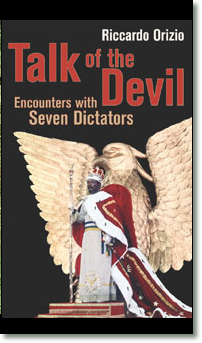 "
This might be darkly interesting, but Orizio's actual "encounters" are often brief and padded out by lengthy how-I-managed-to-get-to-the-dictator preambles. "I would certainly not be here were it not for a recent and bizarre diplomatic initiative on the part of our minister for foreign affairs," for instance. In his short but necessary summaries of the crimes of which his interviewees are accused -- certainly they would not be expected to venture this information themselves -- he is too often guilty of leaving out the larger political background. He tells us -- and this is one of the reasons why writers choose dictators as subjects -- that Bokassa was simultaneously "president-for-life, minister of defence, justice, home affairs, agriculture, health and aviation" and that he had himself crowned Emperor of Central Africa "in the Palais des Sports Jean-Bedel Bokassa, on Bokassa Avenue, next to the Jean-Bedel Bokassa University." But without some analysis of why so much of Africa was taken over by military dictatorships in the 1960s and '70s, this becomes an empty exercise, itself a kind of homage to the tyrant's cult of personality. And while the author does occasionally note that his subjects seem to have "a talent for embellishing the past," he does not -- cannot, perhaps? -- provoke them into contradiction. The book thus becomes no more than a record of official intransigence, of seven "of course, there may have been some excesses" readings of the past. The legendary Polish journalist Ryszard Kapuscinski supplied a preface to Orizio's first book, Lost White Tribes, and in his chapter on Mengistu, Orizio quotes from Kapuscinski's The Emperor, an account of the workings of Ethiopian dictator Haile Selassie's court. So it might be worthwhile comparing his method to that of Kapuscinski, another man just as familiar with encounters with dictators. One thinks specifically of the chapter "Amin" in Kapuscinski's book The Shadow of the Sun, a telling account of the regime of the Ugandan strongman and of dictatorship in general. "Moving from place to place, Amin in a sense moved the state with him; outside of him, nothing happened, nothing existed," Kapuscinski writes, but throughout he obstinately refuses to let the dictator appear in the first person with his own version of the story. As men and women who have spent their lives, as Orizio notes, "insulated from reality," given instead to imposing upon it their own personal fictions, tyrants are too far gone to lead us to "a greater understanding of ourselves," as Orizio hopes. Tracking fallen tyrants down to the remote locations where they see out their lives, he finds himself only joining the ranks of those to whom these men and women have dictated. ? Chandrahas Choudhury is a writer living in England.